Our product is based on "Terra 4D" our ultimate PSIM solution offering a Unified Command and Control Interface for Geo-Visualization of Intelligence, operator guidance and Precise Decision-Making. Result: Streamlined workflow processes cut training requirements and accelerate response times and security over all. 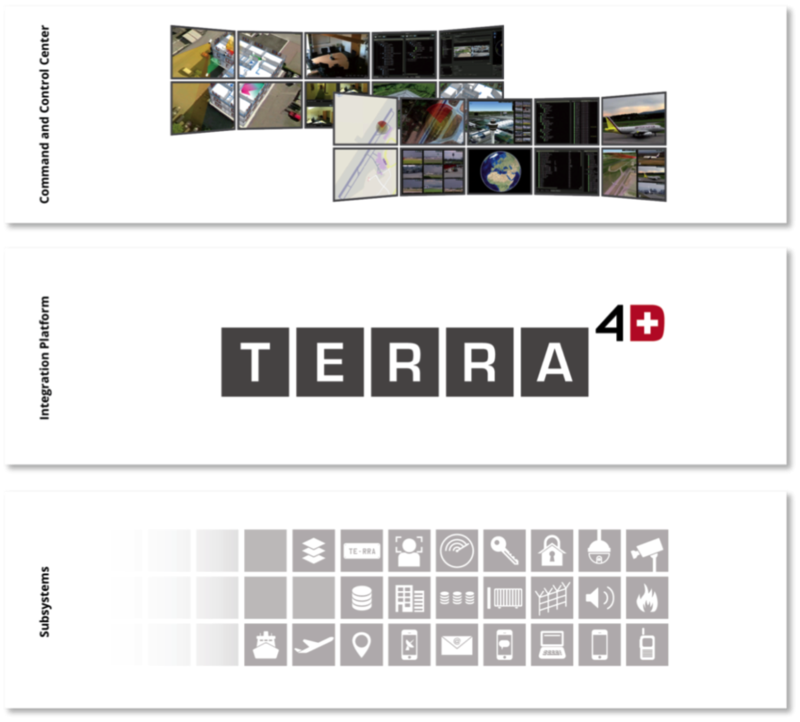 Existing infrastructure can maintain operational while Terra 4D exchanges selected information from and to subsystems and sensors for geo-correlation, visualization and control. The technology has been developed by our R&D center FAST Protect GmbH in Friedrichshafen, Germany. The architecture of the Terra 4D solution was from the start a top down design for an enterprise client server solution. Maximum availability, security, interoperability with other systems and usability were the corner stones from the very first day of the system design. The product design was optimized for distributed physical locations and concurrent multi user access. The powerful user management and flexibility in the configuration meets the needs for the most demanding security scenarios and concepts. Human beings obtain over 80% of their information visually, by presenting this information in its perspective of time and space provides an exceptional tool for quickly comprehending security issues and how to handle them effectively. Situation awareness is augmented through the online workflow (Standard operating procedures) that guides the operators, providing the most effective situation management possible. Further details to the architecture can be obtained in the proposed system architecture section below. The Geographical Information System (GIS) combines static geographical information and dynamic real-time information as layers into one 2 or 3 dimensional view. This way all relevant information can be shown embedded into one virtual reality view to provide enhanced situational awareness. The operator sees all security relevant information on one screen to understand the context and to be able to take decisions. The interactive GIS system allows the user to control mobile units and devices in the field directly from the virtual reality platform. TERRA 4D ISTAR has interfaces to comprehensive centralized off the air, probe based and software based GSM interception and location as well as satellite surveillance systems for national security, military intelligence and global law enforcement agencies. The supported air portables and fixed monitors provide discrete surveillance, interception of voice, text and data as well as location of all mobiles (regardless of network) anywhere globally. Its discrete use includes continuous monitoring a 30 km wide strip of land on the inside of a bor- dering country. Within this area it is possible to track the movements of infiltrators as they move from country to country. This equipment operates covertly around the globe, without adjustment or calibration. Units can be concealed in an agent’s briefcase or in a vehicle. TERRA 4D ISTAR supports voice and Internet probe based interception products for voice, SMS, chat, social media, email and financial transaction capture. TERRA 4D ISTAR is designed for coast- guard surveillance in territorial waters, anti-piracy programs for the high seas, border surveillance and the fight against organized crime including drug trafficking. FAST Protect is a pioneer in the field of digital security and surveillance technologies and is revolutionizing the way organizations and governments protect people, property and assets. The core R&D team of FAST comprises the combined experience of over 100 man-years and 300 000 installed video channels in over 15 000 installations worldwide. FAST has extensive experience in designing, implementing and maintaining large-scale security, public safety and industrial projects. Our innovative solutions protect airports, cities, nations, borders and private concerns from internal and external threats, enabling our customers to manage complex challenges in a cost-effective manner. FAST has extensive experience in designing, implementing and maintaining large-scale security, public safety and industrial projects. Our innovative solutions protect cities, nations, borders and private concerns from internal and external threats, enabling our customers to manage complex challenges in a cost-effective manner. We are quick to respond, flexible and always at your service. FAST Protect designed a smart state-of-the-art solution for command and control operators with a user- friendly interface. By dispensing access to crucial information in a geospatial context, FAST Protect provides humans with perspicacity of space, time and motion. Subsequently, humans will have an omnipresent and exceptional situational awareness, comprehend complex situations much faster and consequently take efficient measures based on accurate and meticulous evaluations that no other technology on the market today, can offer.